Hi, Fellow BYC fans. I thought I'd share my recent experience building my first ever major project, a coop for my hens. After spending way too much time looking at designs, coop pages and how to articles, I decided it was time to just leap in and see what I could actually do. 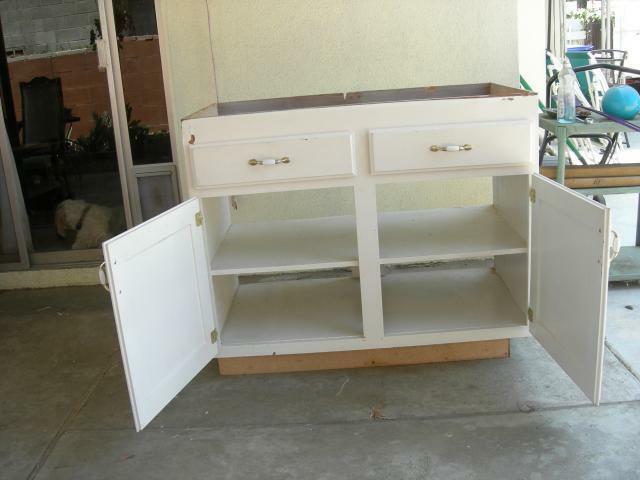 I bought a used bathroom vanity at the local Habitat Restore, thinking this would be the basic size and shape needed for a coop, with doors already functional. Great idea, but not so practical. I needed to remove the shelf in the cabinet, but it was put in with so many huge staples that by the time the shelf was out, the whole cabinet fell apart. Also, I was not able to remove all the staple ends from the cabinet front, so that created gaps when attached to the sides. 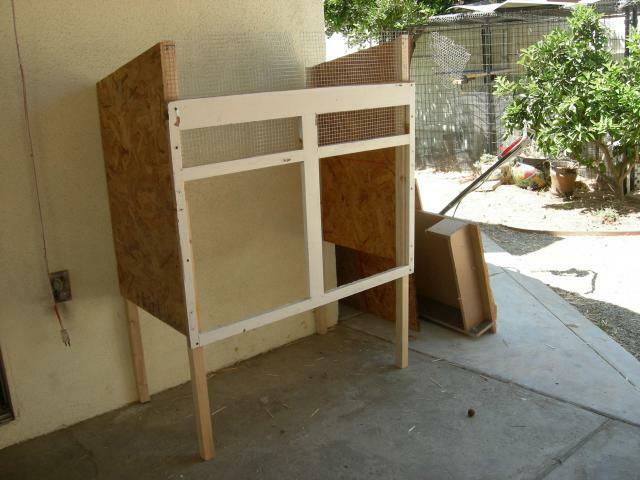 After reflecting on this for a day or two, I decided that I would use only the front of the cabinet, and just build a coop using that front since it already had nice doors. Boy, am I impressed with doors. Have I mentioned that one of the limitations I faced was the need to put the coop into a dog run that I use as my chicken run? The door opening is barely 24" wide, therefore my coop could be no more than 23"deep. Anyway, my next big idea was that it would be nice if the coop was raised off the ground, to eliminate stooping to clean the coop and remove eggs. I'm a very capable woman in my late 50's, and comfort is starting to rule my world. So, I wanted my cab/coop off the ground, and this meant putting it on legs, so I cut 2x2's long enough to raise my coop 17" from the ground, and allow the roof to be 5" above the original top of the cabinet (to make a sloped roof). I cut 2 front legs this length, and two back legs 5” shorter. I also cut out the right and left walls for my coop, using oriented strand board, with the slope I had chosen for the roof. I screwed the legs to the OSB creating the two side units, then struggled around getting the front attached to the sides. With that done I had a wobbly 3 sided structure that would stand up while I figured out how to make the rest of the coop. My next segment was the floor. 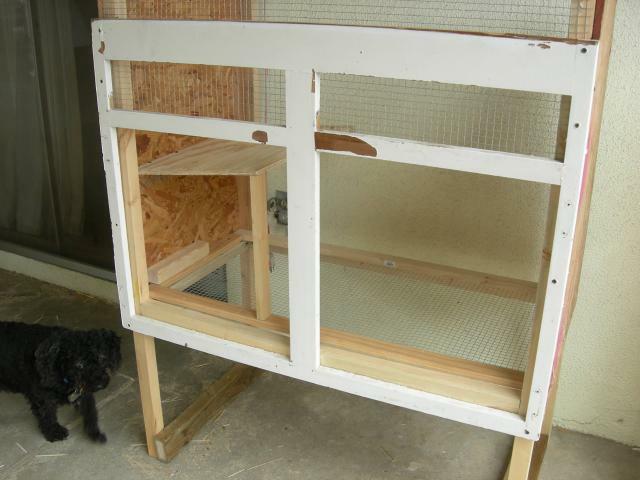 I had become convinced that a wire floor would be the most versatile, allowing life saving ventilation in the summer, which I could block with plywood for the cooler months to improve warmth inside the coop. It was important to me to completely cover all the wire ends, to improve safety for the birds. I also wanted to leave no exposed screw points, for the same reason. This was all done in the trial and error method, taking longer than I would have thought possible. I cut and applied each piece of wood one stretch at a time, which eventually made the structure firmer. By this stage I had determined that an exterior nest box would be too complicated for me, and also too large for the 5’ width of the run, so I followed the lead of a fellow BYC member and left the nest box on the floor level of the coop, with a sloped cover, immediately under the roost. I used a large plastic shoe box for the nest box, and used redwood for the roost and the mini roost at the side of the nest box I had leftovers of pressure treated wood that I used to make braces between the front and back legs, also making a wide enough surface to allow attachment of casters. These were a huge help during the construction, but not much help for getting the finished coop over the gravel yard and into the run. he back was next, with a cleat to help support the cover to the nest box. This is when I realized that I had skipped making a pop door, and was it ever fun cutting out that hole! I made the little door from some ½ inch plywood, and used 2 little hinges and a hook for closure. 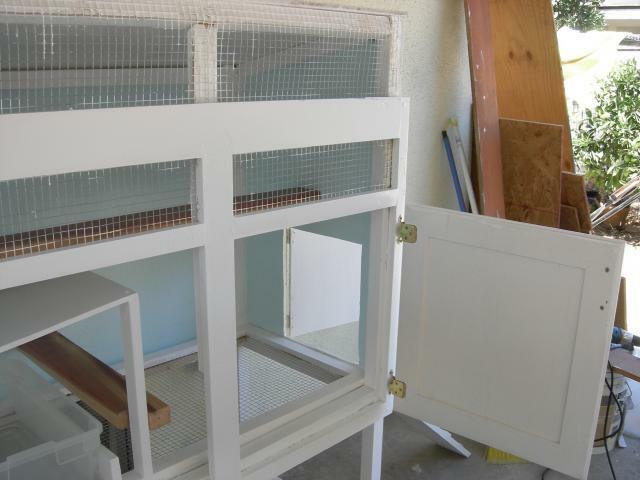 I also made a little ramp, with the step strips made from paint stirs.This was permanently attached after I got the coop into the run. The roof was the last major piece, and I have yet to attach the metal pan over it which will provide the water protection for the coop (actually an oil drip pan made to protect garage floors).The two roosts I finished with spar urethane, everything else got painted with leftovers of interior and exterior paints, all after a generous coat of exterior primer, essential with that OSB. The openings for the two drawers are covered with hardware cloth, along with the extended height of the front of the cab/coop. 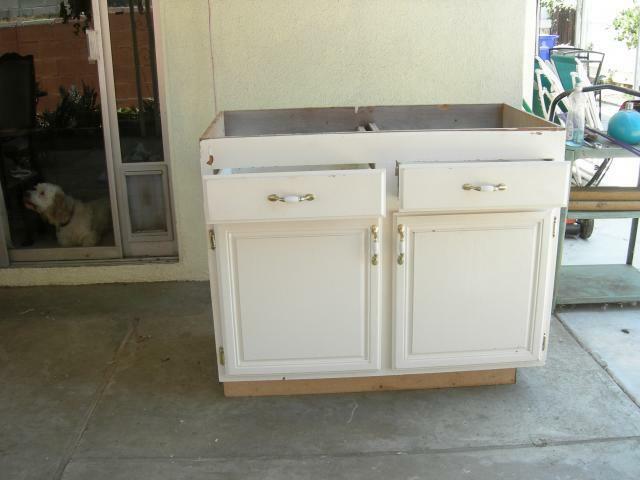 Again, valuable ventilation, though I will probably attach the drawer fronts to hinges, and put them over the openings, like awnings, held out by screen door hooks, which can be removed to allow the openings to be covered by the drawer fronts. We’ll see when that gets done. Anyway, I now have 4 hens and they have spent the last few nights in the coop, with no problem. Each morning they are out of the coop when I get up, since I don't latch any of the doors, There’s no easy way to expand this coop, and I’m trying to decide how to add another nest box. It’s pretty tight already. Here we are several months later and I have a much better understanding of life with chickens. There are a few modifications that would improve my coop. 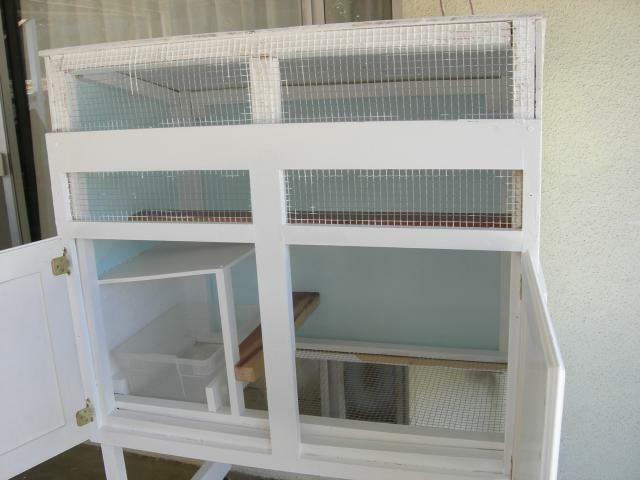 The first change I will make, someday, will be to add a two story nest box addition. One nest box has been adequate for my 4 girls, but the arrangement in my coop turned out to be difficult to clean. The top on my nest box is too close to the roost above it, creating a tight area that is their favorite place to poo. I daily scrape the stuff off with a long piece of baseboard trim, and it's amazing how much "dirt" the girls generate. I then cover this with newspaper to improve the cleanability, and most days it stays in place and works somewhat. My next change would be to eliminate the nest area in the main coop, and lower the roost to maybe a few inches above the floor. 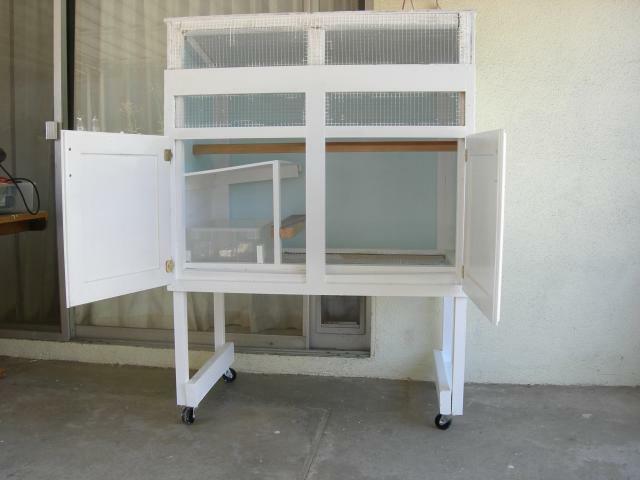 This would keep the chics a bit warmer (since they would be below the drawer openings) and allow an easier hop in and out for the girls. It would be even better if this roost were removable to aid in cleaning of the roost and the floor below it. I have found that it works for us to not bother securing the doors at night, since they are in a very secure enclosure. This way they let themselves out in the morning, so they are usually already out and eating when I get up. I know this wouldn't work for everyone, and I didn't do this routinely until a friend donated some metal roofing to cover the run, making my birds much more secure. On a positive note, the girls seem to enjoy the elevated coop, and they really enjoy being under the coop. I frequently see them roosting on the cross supports between the front and back vertical legs, and Bonnie, my comet hen, created a "chicken spa" under the coop, where all the girls take turns having dust baths! Another small challenge I will "someday" tackle is getting the water blocks level. They started out level, or nearly, but they seem to have shifted a bit, and now the waterers leak a bit. We've had record breaking rains here this last month or so, and between that and the fact that chickens never stop digging the floor of the enclosure is pretty uneven. My expected answer to this challange is the use of paving blocks, but I don't think it would be best for the girls to land on the blocks hoping out of the coop, or off the other raised roost in the enclosure. I don't go into the enclosure at night to close their doors without taking the flashlight. I tried wiring a light into the coop, which worked great for me, but it had the unfortunate effect of making the chics hop out of the coop, thinking it's time to get up, I guess. My last suggestion, today, is to just get going and try whatever you think will work. 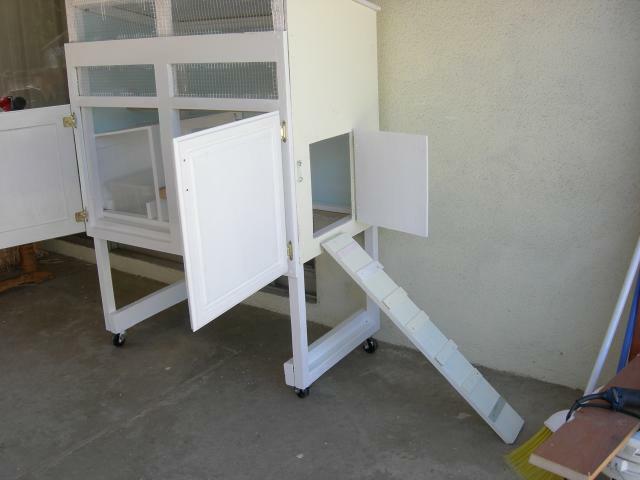 Chickens need protection from predators, and you want to make it easy to take care of the daily necessities of feeding, watering and cleaning, while allowing comfortable space to move around. Good luck and have some fun while you're working on your own chicken adventure. I liked your article and your coop. I enjoyed how you walked with us through your process and thinking as you made your coop. I also, liked how you came back and reflected on what worked and what needs to be changed/modified. This cabinet into coop is creative but not very practical.